My name is Kara Emig and over the summer I studied abroad in London through SAI at Central Saint Martins. 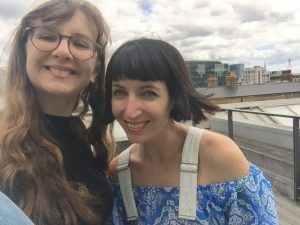 As a fashion student from Pratt Institute, I was ecstatic to have the opportunity to study at one of the best fashion schools in the world while exploring London and discovering the city I had always wanted to visit. Before my SAI experience, I had only visited London from the comfort of my television screen through shows such as Sherlock and movies like Love Actually. London is also one of the major fashion capitals of the world that cultivated some of my favorite designers, including Alexander McQueen and Vivienne Westwood. British music is some of my favorite, including bands such as The Beatles and Queen. With so much creativity calling to me, I knew I had to witness London for myself, and what I found there will stay with me forever. Although I found this great independence, one of the biggest things I found in London was friends. Being very nervous when I arrived, I surprised myself by reaching out of my comfort zone and meeting new people. I met people from all over the world including California, Brazil, Australia, South Africa, and India. 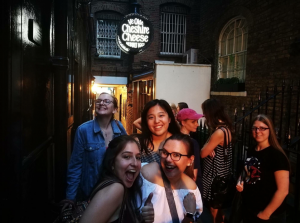 We all came to London for the same thing: adventure, and we found it when we spent the weeks of our courses exploring museums, markets, and landscapes. It didn’t matter where we came from or how old we were, we were all connected by our love for fashion design. Outside my classes, I also made friends with fellow SAI students studying different subjects at other schools. I don’t know whether it was bonding over our jet lag or checking in with each other through SAI scheduled events, but we found ourselves exchanging Instagram names and Facebook pages. We hung out on our own outside of the SAI events and loved sharing stories about our classes and the new things we had seen. Now back home in the United States, I am still in contact with many of the friends I made in London. The friends I made through SAI and my courses helped make my memories of London that much more exciting and memorable. Being in a new place by yourself can be scary, but it doesn’t have to be when there are others in the same boat as you. People all around you in your courses and in your SAI term also want to make friends and help you figure out how to do your laundry or figure our how to fill your Oyster card. The girl in pearls may just be an incredible ballet dancer and painter, or the girl with the cool black bob may just know how to design and construct the perfect bathing suit, but you will never know unless you ask. My advice to those going abroad is to have fun with those around you and to stay curious. You will meet people so naturally, it will surprise you how they find you and enrich your experience. It doesn’t matter where you are in the world, you will find others just as passionate as you are and willing to have your back. Traveling can be very overwhelming, but it will all be okay in the end and don’t forget to have fun! Me and my friend Rose on our last day of our CSM course. 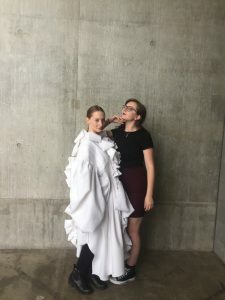 Kara was a SAI London summer 2017 student from Pratt Institute.